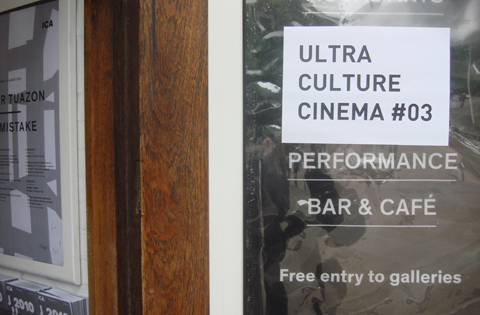 On July 8th 2010, Ultra Culture Cinema returned to the ICA for our third night: a special preview of Bong Joon-Ho’s transcendent revenge thriller Mother, almost two months before its theatrical release. As ever, there were plenty of surprises in store, not least that my introduction would be the most ramshackle spectacle since rams were first shackled. After seats had been taken and notes had been handed out (although most people must not have got them because there were about 150 left at the end) the fun began. We went a bit mental with the prizes and pretty soon the whole thing turned into a bit of a scrum, with people wandering around eating Curly Wurlys and drinking Sainsbury’s economy Lemonade. Still, at least the ‘party atmosphere’ had begun. Things got back on track (a bit) for our putting competition, in which three slightly hesitant volunteers attempted to roll golf balls into a hastily prepared cardboard putting range. A man called Josh decided to walk right up to the hole and pop the ball in by hand, and was rewarded with Bong Joon-ho’s entire back catalogue on DVD and Blu-ray. Next to ‘take the stage’ was an actual proper entertainer, mind reader Chris Cox. He wowed the audience with incredible magic and even incredibler jokes about The Wicker Man, and his last trick was only slightly ruined by his volunteer ‘not saying the word out loud’ by saying it very much out loud. I’ve never heard such a good response for a cutaway shot of some flower pots. The audience quieted (apart from the audible excitement that erupted when the screen expanded to 2.35:1) and then Mother began. And of course, it was amazing. Thanks to Optimum Releasing for providing prizes for the night, and thanks to David Cox, Tej Jouhal, Chris Cox, David Roy, Zoe Flower, Joe Venning, James McLoughlin, Anthony Ing, and everybody else who came along on the night for being such wonderful Mother fuckers. – Download our film notes on Mother. – A review of the night by Little White Lies’ Tom Seymour. – A review of the night by Tim Brown. – A review of the night by Joshua Samonini. – A review of the night by Adam Batty. – A review of the night by Katie Paxton.